The books I read and/or review tend to be devotionals, supernatural fiction, fictional stories that teach spiritual truths, and similar works. “I Choose Hope” by Nikki Abramson is an eye-opener to say the least. This is a story of struggle, a story of frustration, a story of questions without answers, and yet also a story of encouragement, a story of the stabilizing power of faith in Jesus Christ, and a story of overcoming. A harsh critic of the book might point out all the correctly spelled misplaced words appearing here and there throughout the book. They might point out how she repeats the exact same thought within mere sentences of each occasional occurrence, or how it appears at times as if this book has given her a platform to vent. However, by the time you reach the end of the book, you discover not only who is writing it, but perhaps be forgiven for overlooking any literary shortcomings out of desire to extend the same kind of mercy and grace that she longs to show to others. 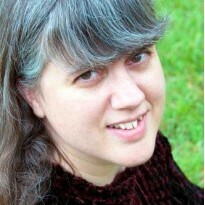 In some of her venting moments of this book, the reader is given a rare glimpse inside the mind and heart of an adoptee. Knowing friends who have adopted not one, but two children themselves, I could see some of their efforts in raising their children in Nikki’s descriptions of how her parents raised her. If you are an adoptee yourself, or raising children adopted from another country and culture, you too may see yourself in these pages and perhaps as an adoptee, finding yourself both relieved and amazed that someone else has finally given voice to what you dared not share with anyone in the past. As the reader will quickly find out, adoption would turn out to be the least of her concerns, as various rare but almost debilitating medical conditions found her one by one. The mere fact she is alive to write this book, has been reason enough for the friends and mentors in her life to insist she tell her story! In fact, as she prepares to share her story, she is now dealing with ALL of her various medical conditions at the same time. You’ll understand why this is so amazing when you read this book for yourself. Some of her more common issues I actually deal with myself on a regular basis. Things like allergy-based asthma, which it sounds like her doctors have misdiagnosed too, just like doctors did for me years ago, the treatment is not the same as regular asthma, similar, but not the same. In fact I had to swear off my asthma meds when I discovered that the second puffer was a corticosteroid, which suppresses the adrenal system! As one recovering from and still dealing with adrenal fatigue (which Nikki describes but doesn’t name during her descriptions of her latest malady), the last thing I wanted to do was continue to damage my adrenal system. I’ve found a natural antihistamine that helps the sinuses and upper respiratory system, but nothing yet to replace the lung medication. Spring and Fall are now my two worst times of the year as a result. Needless to say, I have the unfortunate ability to identify with some of her health struggles. The real encouragement in the book for me, is hearing how growing up in Church gave her a solid foundation; hearing how prayer groups, prayer partners, and Bible College staff and students spoke into her life and encouraged her. We don’t always understand why God allows various things to happen in our lives, but when we realize that perhaps, those things are happening to us not to deliberately cause us unending torture, but to be there for others along the way, our ability to manage what God has allowed grows in leaps and bounds! Nikki has found this to be true in her own life, as her choice of hope gave her the kind of bubbly personality that lifted the spirits of everyone she came in contact with. It is my prayer that God will give Nikki many more fruitful years. I pray that God will miraculously touch her various maladies and that each of them will disappear from her life one by one. I pray that those who come into contact with her will not merely see an overcomer, but see Who has helped her to become such an overcomer, that they will see Christ in her and come to know the One who has given her such strength and stamina in spite of all she faces. What are you going through right now? Have you swallowed the bitter pill of self-pity and fist-shaking at God, or have you caught a glimpse of the life-changing power touching others through your current situation? May I encourage you, as Nikki will in her book, to choose hope, choose Christ, and choose the path of uplifting others regardless of what is going on in your own life, mind, heart and maybe even your physical body. Nikki joins the ranks of such authors as Joni Eareckson Tada, Nick Vujicic and others who have been dealt hard cards in the game of life, and yet gone on to encourage millions in ways they never would have if God had allowed them to be healthy and whole. Remember, your situation may not be for your benefit, but the benefit of someone else. 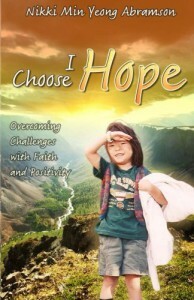 I encourage you to go get yourself a copy of Nikki’s book, “I Choose Hope” from Amazon.com. You won’t regret it!